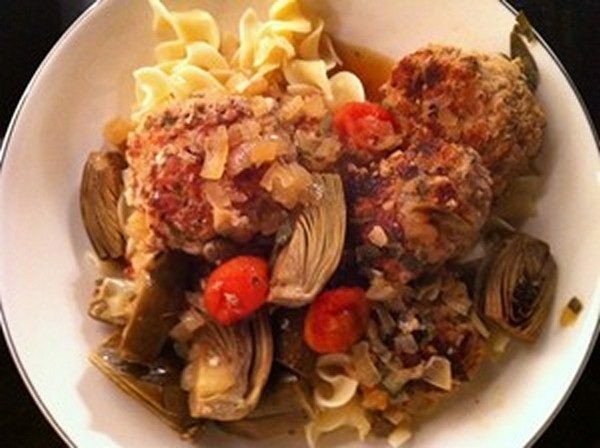 When the cool weather comes, the Accidental Locavore always wants to make these meatballs, but baby artichokes aren’t always around. This week, we hit the jackpot and found them in two colors! At the new (and pretty amazing) Eataly, they were there in both green and purple, so of course we had to have them in both colors. It’s a lot of prep work, but nothing difficult, and the results are worth it. I serve them over egg noodles, but feel free to improvise, and let me know what you like to serve them over. 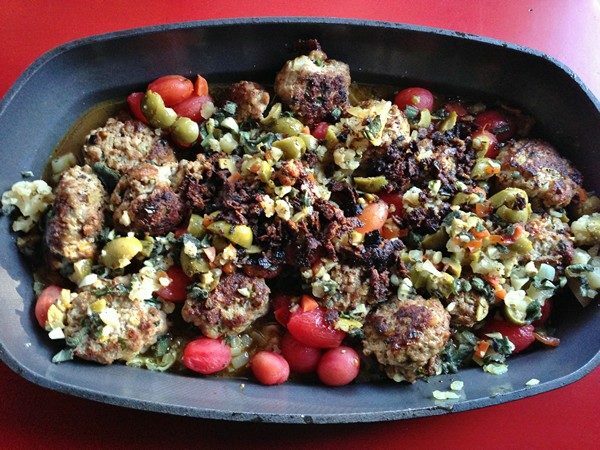 Make the meatballs: In a large saute pan, warm 3 tablespoons of the olive oil, add the onions, salt and pepper them lightly, and cook over moderate heat until soft, about 8 minutes. Do not brown the onions. While the onions are cooking, put the veal, parsley, eggs, Parmesan, and breadcrumbs in a mixing bowl. Add 1 teaspoon salt, and 1/4 teaspoon pepper, and 1/3 cup of the cooked onions. Mix well. Form into meatballs about 2″ in diameter. You should have about 16. Put the remaining onionsin a large gratin pan or casserole and set aside. Wipe out the saute pan, and add the rest of the olive oil. When the oil is hot, add the meatballs and brown them on all sides (about 2 minutes a side). While the meatballs are browning, prepare the artichokes. Snap the outer leaves off until you reach the pale green center. Cut off the stems, and trim the bottoms. Cut off about 1/2 inch of the tops, quarter them the long way, and put them in a bowl of water with the juice of 1/2 lemon as you work. When the meatballs are browned, add them to the baking dish with the onions. Drain the artichokes, and add them along with the tomatoes, garlic, olives, and sage. Sprinkle with salt and pepper. Add the lemon juice, and the chicken broth. Cover and bake for 1 hour. Serve and enjoy! Recipe: Frank’s Amazing Meatloaf, Always Good and Easy! 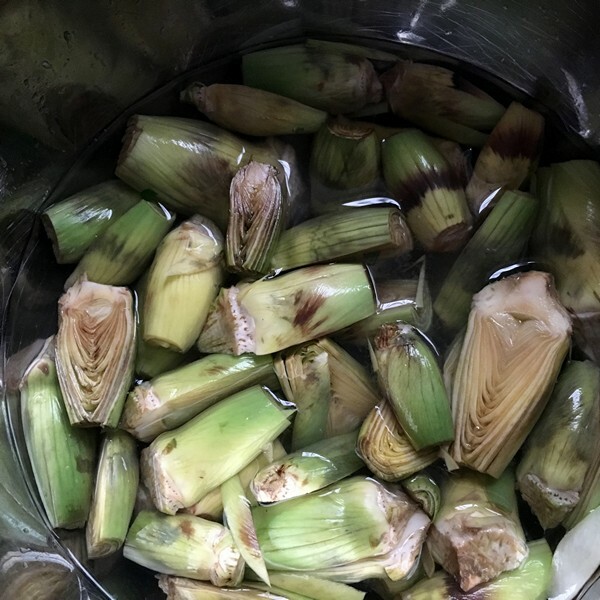 Previous post: Accidental Locavore Farmbasket Week 16, What, No Brussels Sprouts?